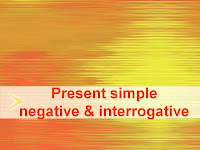 In the simple present tense, negative forms and question forms are made using the auxiliary verb DO. This page explains the rules. In other words, only third person singular subjects (he, she and it) have doesn't — the rest have don't. Do I Do I sing? Do you Do you sing? Does he Does he sing? Does she Does she sing? Does it Does it sing? Do we Do we sing? Do they Do they sing? I sing Do I sing? What do I sing? You fight. Do you fight? Why do you fight? He lives Does he live? Where does he live? And now... As one of my teachers used to tell me 'PRACTICE MAKES PERFECT'... Let's practise!! AND FINALLY, TRY THIS GAME! !